I haven’t had a Beef Stroganoff in years. I can’t even remember if I’ve ever cooked this particular recipe. Saturday night is the last night of Sue’s play, so this will make a great evening meal for Sunday evening. Apparently the tail end of beef fillet is the preferred cut for stroganoff. I’m not sure how easy that will be to find, so I start by looking at the on-line butcher that I get most of my meat from, The Well Hung Meat Company – their meat is excellent, it’s all organic, fully traceable and from local farms. I’m rather surprised to immediately find tail-end beef fillet available there. I’m sure I’ve not seen it before, I guess it’s a new product – they do add things to the range from time to time. 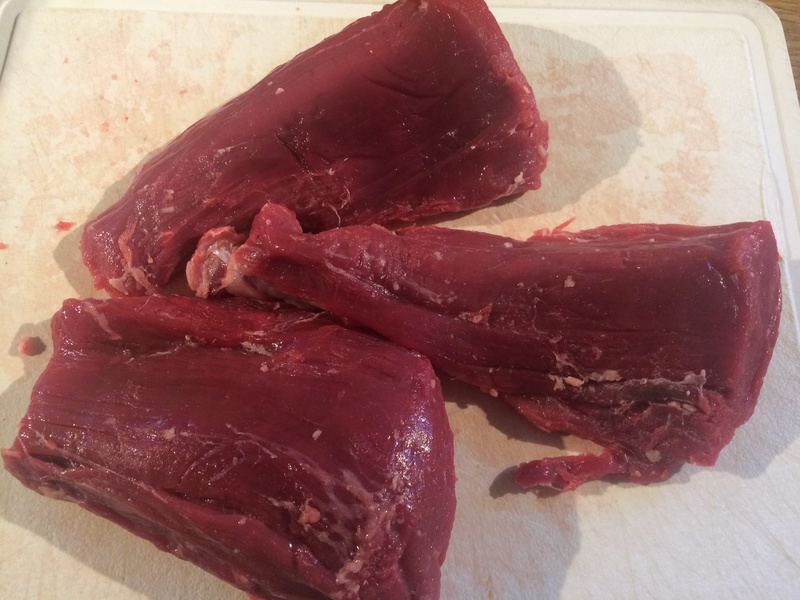 I get a meat box from them every month, and one is due soon, so I add two packs of tail-end fillet to my order. Thursday: the meat box arrives. It’s the middle of the afternoon and I’m busy, so I quickly unload it into the fridge and get back to work. There a couple of large cuts of meat in there that I have plans for, and once I’ve finished work for the evening I take out a piece of silverside and start trimming the fat off it. I’m going to turn it into corned beef, but that’s a story for another day on another blog. So, I salt and spice the beef, and return it to the fridge. 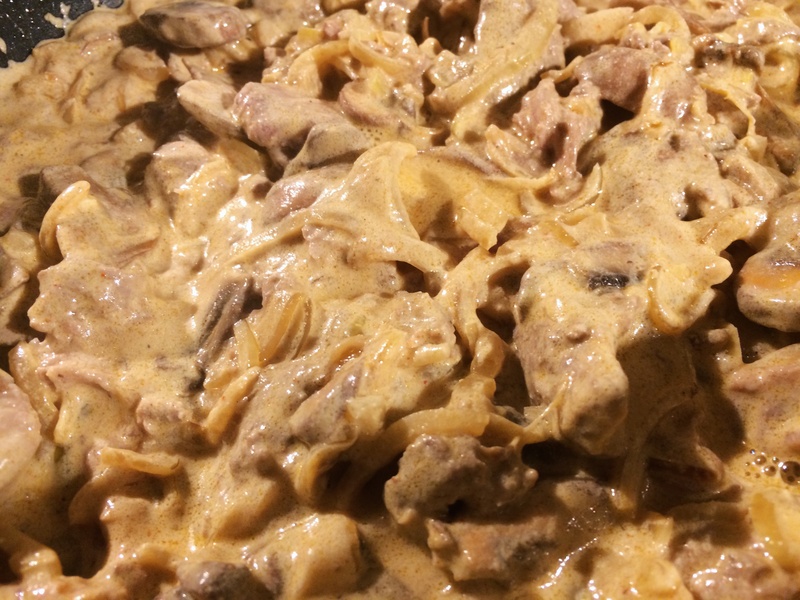 Later on in the evening, I’m thinking about the weekend’s meals, and remember that I planned to make stroganoff. That’s right, I ordered beef fillet tail-end, didn’t I? I don’t recall seeing that when I unpacked the box, I was rushing though, and wasn’t really paying attention. I guess I just missed it and go to fridge and check. Ah, there’s a pack labelled Beef Fillet Steak – I guess that must be it. It doesn’t actually say ’tail end’ though. This must be the right thing. But there’s just the one pack – I ordered two! There’s no sign of the second. Oh great. That’s really irritating – I guess I could just halve the recipe – there are just the two of us, after all – but if I’m going to all this trouble, it’s nice to have some leftovers for later in the week. Bah. I’m annoyed. I write a stroppy email to Well Hung, complaining that they’ve ruined my Sunday dinner and demanding a refund for the missing meat. The next morning, I check my email. No reply from Well Hung yet. Whilst making my coffee, I remember the corned beef. I need to turn it every day for the next week so that the juices evenly coat it. I take the corned-beef-to-be out of the tray at the bottom of the fridge, and notice something squished up into the back corner. I fish it out, only to find that it’s a pack of beef fillet. It’s the missing meat. It wasn’t missing at all, it had just got pushed to the back and had escaped my notice when I was looking for it the previous night. Oh, that’s rather embarrassing. There’s nothing for it but to email Well Hung and apologise. I am very contrite. I explain what had happened, and it wasn’t their fault, it was all mine. Shame-facedly, I click Send. A short while later, I receive an email back from a chap called Zack. He’s very nice about the whole thing. He said he was pleased that I had found the second pack. He also confirmed that it really was tail-end – he conceded that the labelling wasn’t clear on that, but they’ll fix that – it apparently is a new line for them. I continue to feel embarrassed. Sunday. Time to make the stroganoff. The recipe looks very straightforward. 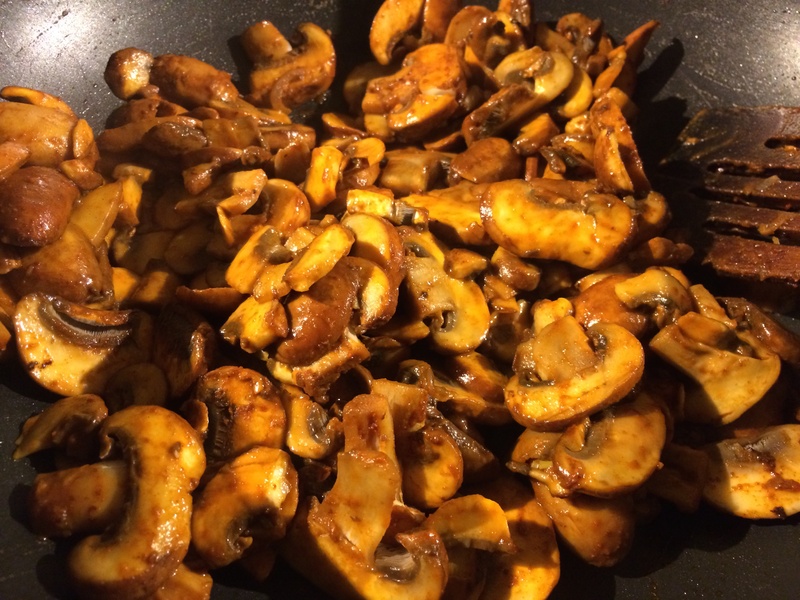 I cut the meat into thickish slices, and slice the mushrooms into a bowl. Hmm, that’s a large bowl and it’s nearly full – that’s an awful lot of mushrooms. Sue can be a bit funny about mushrooms. She claims to not like them much, but then invariably eats them whenever I serve them and then tells me how tasty they were. Oh well, there’s going to be no disguising them here. 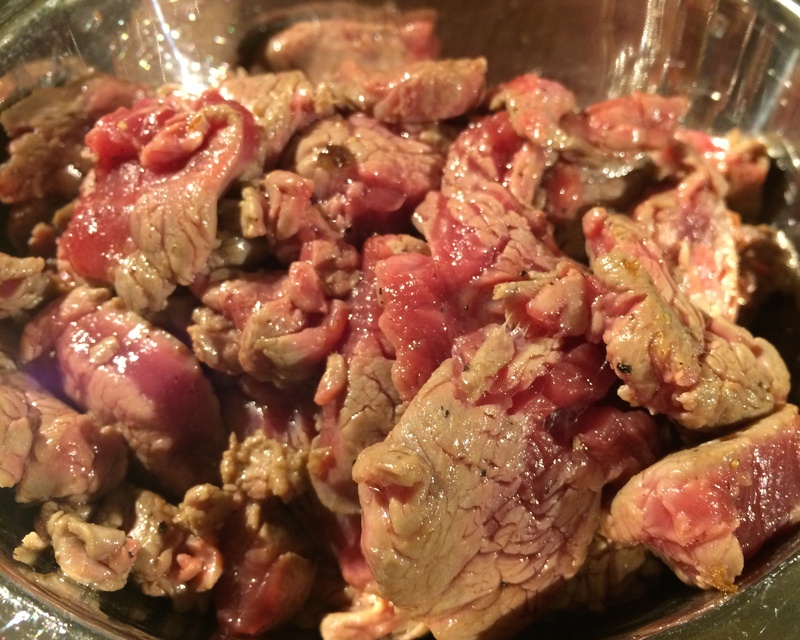 I season the meat and brown it lightly in some oil, then set it to one side. I cook sliced onions in butter until they’re golden and soft, and then set those to one side. Then, I cook the mushrooms in a little more butter, together with some paprika, until they’re soft, and set those aside too. Next, I heat some sour cream in the pan and warm it through until it’s liquid, than add the beef, onions and mushrooms back to the pan and simmer gently for ten minutes or so. To finish off, I add some lemon juice and chopped dill, and serve – I served it with boiled potatoes, as recommended by the book, and also the last of the purple sprouting broccoli. It tasted good. 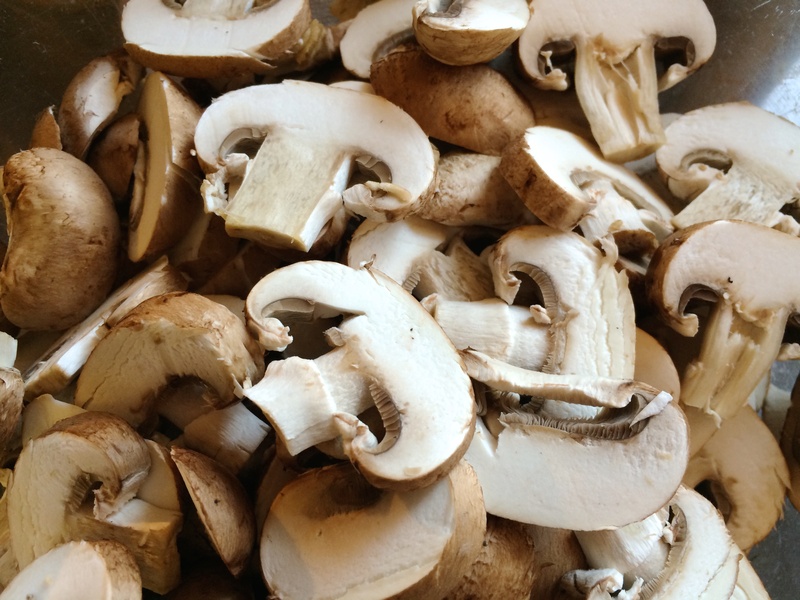 The vat of mushrooms reduced down to something more manageable during cooking, so they didn’t dominate too much. The beef was deliciously tender, and the lemon juice offered a nice zing to the whole thing. And what’s more, Sue liked the mushrooms! Well that was most unlike any beef stroganoff I’ve ever made! I always liked my recipe, but it was very different. This smelled and tasted very different. First thoughts were that the lemon zing wasn’t right. I wasn’t sure about it. But by the time I’d eaten some I realised it was actually better than I remembered. Dave served it with potatoes rather than rice which was nice. And my favourite purple sprouting broccoli. All in all I think I like both this zingy version and the more creamy version I remember. They are just different.